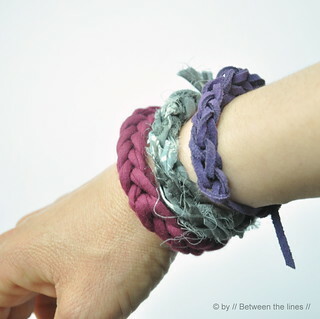 I'm not sure these bracelets will become as popular as my 2010 summer bracelets, but they sure are equally fun to make! When I was looking for friendship bracelet ideas for our school's upcoming summer fest, I came across a 'knitting fork'. Since I don't have a knitting fork but liked the technique, I wanted to try and make a fork with what I had. Coincidentally, I made a Popsicle-stick-catapult just a couple of days ago, also for our school's craft fair and I figured that was the way to go. 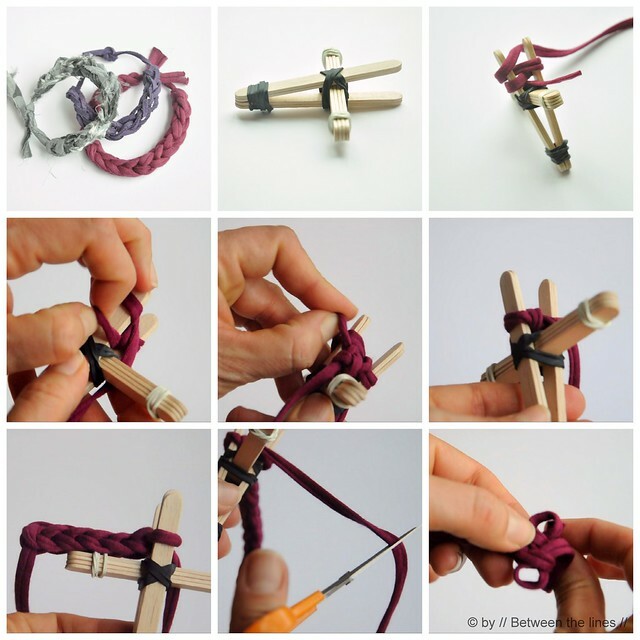 A Popsicle-stick-catapult turned into a knitting fork! Why not?! Talking about a multipurpose tool! The only change I made here is that I used two sticks for each leg to make it a little sturdier and I re-positioned the sticks slightly to get a fork-like tool. 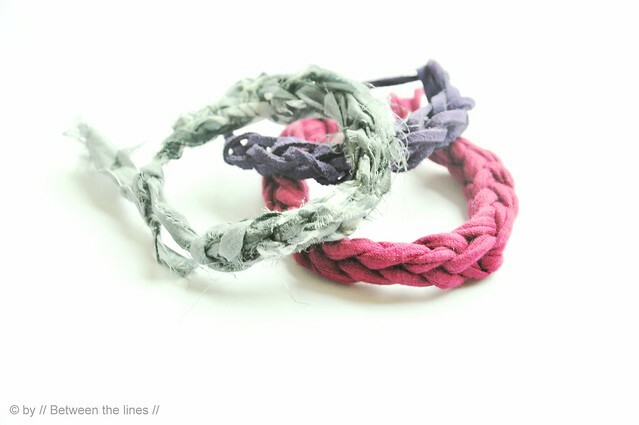 I limited myself to bracelets but the possibilities are of course endless. I'm thinking of necklaces, belts, bag handles... Use your imagination! 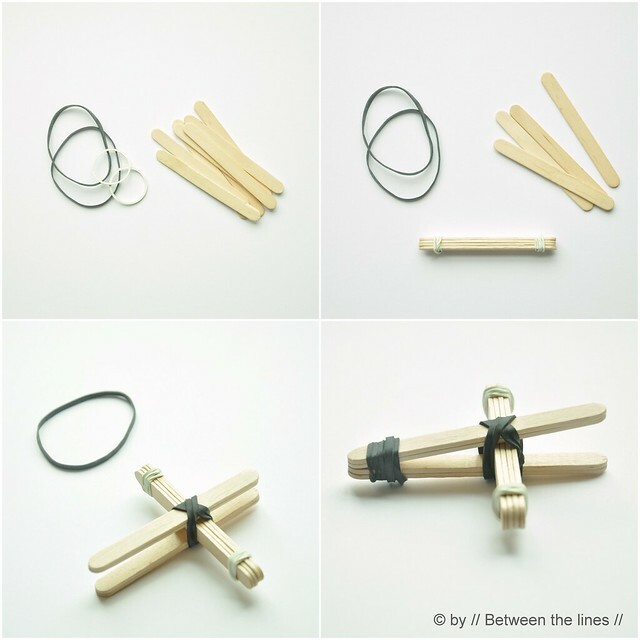 Both, making the fork and the knitting, are very simple which makes this a perfect craft for keeping your kids, even the youngest ones - and yourself - busy on those long summer vacation car rides! The instructions, including a video I made, are below! To see the video in HD quality, click the settings wheel in the right hand corner of the black bar displayed at the bottom of the movie - select quality 1080p for the highest resolution. As to the lengths of the strands of yarn to use: it all depends on the thickness and flexibility of the material you'll be using, so knitting a sample may be in order. Keeping my fingers crossed now for a long hot summer! As with all of my tutorials, please note, this tutorial is intended for personal use only. Therefore, do not reproduce, sell or commercialize in any form. Thanks for understanding!